Today’s airline executives must enable agility in their organisations, continue to deliver service innovation, while competing and ensuring profitability. The winners will be those who can transform their airlines into top performers. Easier said than done in a complex sector that is logistically sophisticated and multi-layered. 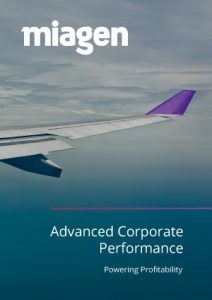 This white paper explains how Miagen builds its aviation solutions with driver-based design principles, combining operational and financial data to build models around key aviation financial productivity and performance drivers. This enables airlines to move from managing by hindsight to managing with insight.